Having examined some of the basics regarding the USB Type-C connector and the Power Delivery 2.0 specification that complements the Type-C spec itself, we'll turn our attention to the topic of cable detection. The Type-C connector is reversible, which is to say there are four ways a cable can be connected between upstream- and downstream-facing ports (Figure 1). Not only that, but there are different types of Type-C cables. So how do the devices discern what's between them? To dig deeper into Type-C cable detection, let's start with the simplest case, which is a source-only downstream-facing port (DFP) connected to an upstream-facing port (UFP), or sink (Figure 2). Other connections are hidden for simplicity's sake; both receptacles are powered and are continuously monitoring the configuration channel (CC1 and CC2) lines. Let's say the cable is being plugged in properly, i.e. 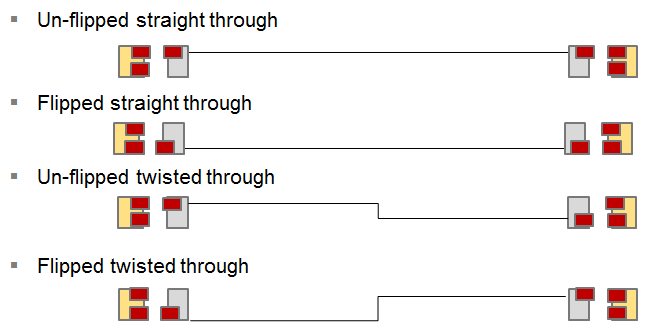 in un-flipped straight-through fashion as shown in Figure 1. Upon cable plug-in, the DFP and UFP monitor the resistance levels on the CC pins. The DFP attaches pull-up resistors Rp, while the UFP attaches pull-down resistors Rd. In the case of the UFP, both CC pins are connected to ground and only sees this termination on the one CC line that's connected, which would be CC1. Thus, it knows this is the line to use for Power Delivery communications. Next, the DFP and UFP route the various other signals not shown here. If the cable were flipped over (flipped straight through as in Figure 1), they would see the same Rp and Rd terminations, only they would be on the CC2 line. If there's a twist in the cable, as in the bottom two examples in Figure 1, each receptacle needs to be smart enough to figure out which pins to use. Fortunately, they are, and will route signals to the correct pins. All of the above assumes a non-E-marked cable. If we look at the same source-to-sink connection but with an E-marked cable, which carries a chip embedded in the CC line that enables the DFP to ping the cable and query it as to its capabilities, we'll see a slightly different setup (Figure 3). That chip embedded in the cable needs a small amount of power, so this is where the unused CC pin in the receptacle is used to provide it. A change of note in USB Type-C is a new differentiation between VBUS and VCONN power. The former is still used for powering or charging connected devices, while the latter is only for powering of E-marked cables and certain other devices. VCONN provides 5 V @ 200 mA and is initially sourced from the DFP. VCONN power does not pass through the cable to the UFP. With both linked partners monitoring the CC lines for Rp and Rd, the DFP is pulling up on both CC pins and again senses the pull-down resistance on the UFP end of the cable. E-marked cables present a load known as Ra. Thus, the receptacle senses another voltage divider; it knows it is attached to an E-marked cable. That means VCONN must be sourced to power the cable's electronics (Figure 4). Only after the two sides determine which line is to be the CC line does the DFP apply power to VCONN. After waiting for a required timing interval, the DFP can now send commands to the cable itself. The end result of this process, in this case, is that the two CC1 pins become VCONN. It is possible that the cable may need VCONN at both ends if it has repeaters or other active components in the plug, so it's up to the cable to propagate power to the far-end plug if necessary. Still, in all cases, VCONN is not passed through the cable but is terminated in the plug's active electronics. In the next installment in this series, we'll look into dual-role port (DRP) devices, which may act as either provider (source) or consumer (sink).